New readers...start here! : So, tell me about the art.. This shows how the end image evolves from basic pencils, to inks, to colours. 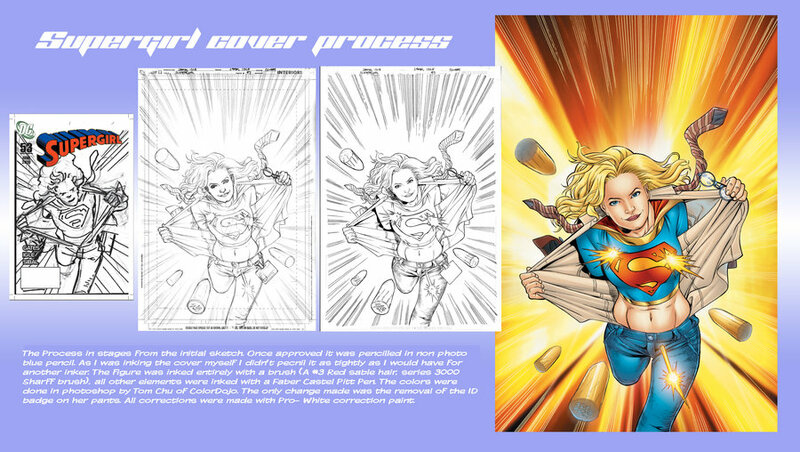 You can also see the process from sketch, to pencils, to inks to colours here, at Dan Jurgens website. 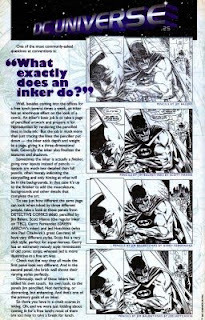 Information on lettering and pencilling to follow, as soon as the scans are located. Manga is usually black and white, American superhero comics are in colour. The other main difference is in how you read them. In American comics you start at the top left of the page and work your way across, left to right, row by row. Sometimes the conversation is layered because the characters are speaking back and forth. In this case, follow the conversation panel by panel. It may sound complicated but you'll get the hang of it easily. In all comics, be they American, British, Japanese, French or Polynesian, you need to be aware of the art and the impact this has on the story. Look at the character's expressions, where they are placed and what symbols are being used within the scene. Look at the use of colour and shading as this will tell you plenty about the mood and feel of the story and the characters. Good art should be able to tell you a story without the need for words. I'd like to point out japanese comics tend to be made in teams as well. Usually there's the main artist and some assistants (most of future artists learning the way from an elder). The assistants work may range from doing backgrounds to full panels, layout or inking. For example: Dragon Ball was done by Akira Toriyama, and his "studio" was Bird Studio. And usually it's a duo of a writer & an artist. But more and more these days, they tend to have their own colorists to work faster. Arg, can't believe I missed this comment. Thank you for the info Eyz.